I think these trees will look just darling on my Christmas dinner table this year. They will be part of a bigger ensemble, but I think they are also really cute on their own. A couple of weeks ago, B and I went on a wilderness survival hike with the homeschoolers. We went to an area where some local teens got lost (article) for several days and were only found in the nick of time, severely dehydrated. Apparently they had taken drugs, went without any water or food and wearing flip flops. So of course we already had them beat by a mile just showing up with our faculties in order, sensible shoes and backpacks with water and food. Nevertheless, it was great to work out all the thing we could do differently had we shown up in flip-flops with no water. We all went to the spot where they first got lost and discussed survival, how to find water, what to eat for 3-5 days, how to preserve your energy, how to build a shelter. Really educational and we had a great time. So what does that have to do with silhouette Christmas trees, you might ask? Well take a look at these wonderful branches I found in the river bed. Here is a survival tip: When looking for water in the wilderness, look low, at the bottom of the hill sides. Don't go up the steep mountain sides as these kids did. At home I handed them over the branches to dh who cut them up for me. CHRISTMAS 2016 UPDATE: WAIT!! BEFORE YOU DOWNLOAD - I have updated these files to include SVG files and more sizes for PDF. (All my craft posts are now posted on A Home for Crafts). Cut two for each tree. Then cut a slit half way through each tree down the center. On one tree the slit should be on the upper half, on the other on the lower half. I included the tree template in two sizes. One takes up a whole letter size piece of paper, the other on a half one. Dh cut an X-slit in the top of the two tree stubs for me. I inserted the trees into those, but you can of course also just put the trees directly on the table. Last year, I made these Felt flower napkin ring and ornament for my fall table. 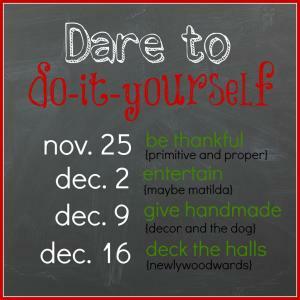 This article: Dare to entertain: Silhouette Christmas trees in DIY branch holders first appeared on http://ahomefordesign.com.